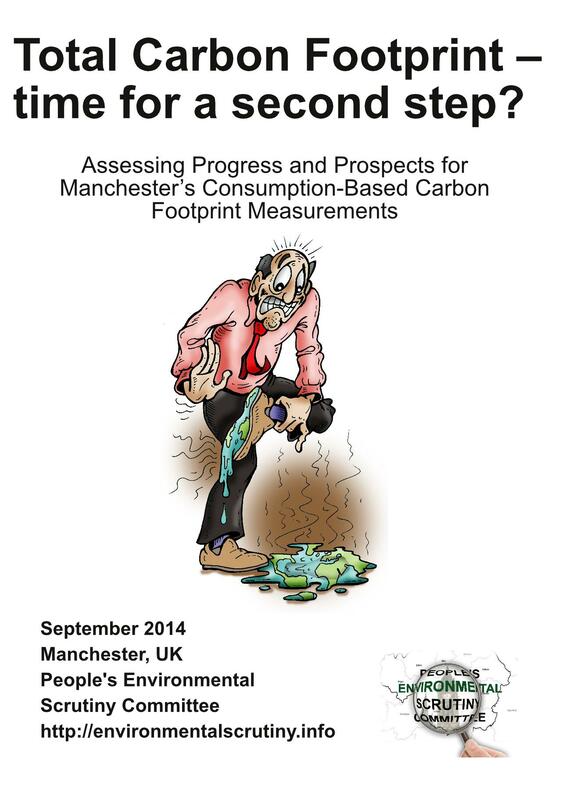 In 2009 Manchester City Council produced, with stakeholders, the “Manchester Climate Change Action Plan” (also known as Manchester A Certain Future). One of the promises in that report was that the City Council would start reporting on its “embedded” emissions (the energy etc that went into producing the cans of coca-cola etc etc that are consumed – put not produced – in the city). That promise wasn’t kept, and the entire approach was kicked into the long grass. Now, Joe Blakey and Claire Woolley have – following intensive research and interviews – produced a short, easy-to-read report that is available for everyone – be they councillors, campaigners, academics or “just plain concerned citizens.” Comments are very welcome indeed. The report (proof-read by Margaret Morris, with illustrations by Marc Roberts) will be formally launched next Monday night (22nd September) at the next meeting of the People’s Environmental Scrutiny Team. * The meeting is free, and takes place at the Moss Side Community Allotment, corner of Bowes and Caythorpe Sts. * Note the name change from “committee” to “team.” Better acronym. Hat-tip to Matt! This entry was posted in Campaign Update, Climate Change Action Plan. Bookmark the permalink.